THE SILENT MAN (1917, Artcraft) William S. Hart, Bola Vale, Robert McKim. Bill stakes a claim rich with gold, but he comes to town, a sleazy dance hall owner cheats him at poker. Bill is kayoed and put on ice. When he wakes, his claim has been filed by the dance hall owner! Bill is forced to turn bandit, robbing the stage for gold rightfully his. Later, the same sleazy cad marries an innocent girl under false pretenses. Bill rescues her and sets out to bring the varmint to justice. One cool scene has Bill dragging the cad across town at rope’s end. Highly Recommended. Music score, 16mm. THE SQUARE DEAL MAN (1917, Triangle) William. S. Hart, Joseph J. Dowling, Mary Jane Irving, J. Frank Burke. Bill is a gambler who decides to play one last game then go straight. During the game, Bill is accused of cheating. Lights go out, shots are fired, and a man is found dead on the floor! Bill is blamed, but who really did it? Music score, 16mm. 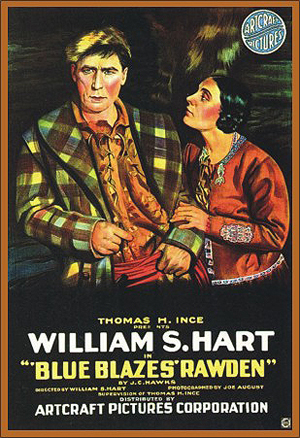 BLUE BLAZES RAWDEN (1918, Artcraft) William S. Hart, Gertrude Claire, Robert McKim, Maude George, Jack Hoxie. A superb Bill Hart epic, choked with pathos, action, and intrigue. Bill is the ruffian leader of a roving lumberjack crew. He and his hooligans tumble into town. Soon, he and the tavern owner shoot it out. At stake are Bill’s poker winnings against the owner’s tavern. Bill wins. Later, the dead owner’s elderly mother comes calling. Bill, ripe with guilt, takes her in and treats her kindly. Little does she suspect that Bill is the cad who killed her son. Music score, 16mm. THE TOLL GATE (1920, Artcraft) Wm. S. Hart, Anna Nilsson, Jack Richardson. Next to Tom Mix, Bill Hart was the biggest western star of the silent era, and this film clearly shows why. Bill is a notorious outlaw whose gang is ambushed and captured by the Army when they attempt one final train robbery. Bill’s lieutenant, Jordan, has betrayed the gang and arranged the ambush. Bill, an ex-war hero, escapes when his guards (who know his heroic past) turn their backs the other way. He then sets out to track Jordan down. One of our best silent westerns. Music score, 16mm.